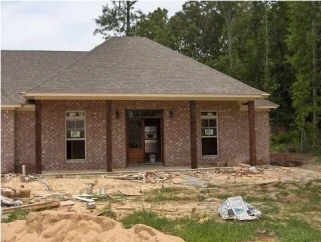 Description: We're under construction on a split plan with 4 bedrooms and 2 bathrooms. The kitchen will have custom cabinets, slab granite counter tops and stainless appliances, a breakfast area with a great window. The foyer and dining room leads to a large family room with a fireplace . The master suite bath will have double vanities, a walk-in closet and separate shower and jetted tub. This home also includes a security system, architectural shingles, crown molding throughout, mailbox, garage door with 2 remotes and wireless key pad entry, fully sodded yard, extended warranty . Time for new owner to pick out flooring,lighting,paint colors. Drive by and call me today to get started.